Why Does My iPhone Turn Off When I Still Have Battery Life Remaining? Here's The Fix! You are at:Home»iPhone»Power»Why Does My iPhone Turn Off When I Still Have Battery Life Remaining? Here’s The Real Fix! I’m going to tell you why your iPhone, iPad, or iPod suddenly turns off when you still have 30%, 50%, or any other percentage of battery remaining and exactly what to do to fix the problem, if it can be fixed. I’ll use an iPhone in this article, but if you have an iPad or iPod with this problem, follow along — the solution is exactly the same. I’ll be honest right off the bat: I can’t guarantee we’re going to be able to fix your iPhone. Sometimes, issues related to iPhones randomly shutting off are caused by water damage or other unfortunate accidents. But don’t lose hope! A lot of the time, you can fix this problem at home. I’ve Got A Faulty Battery, Right? Not necessarily. More often than not, what’s actually going on is that your iPhone isn’t talking to the battery correctly. Your iPhone’s software is in charge of monitoring the amount of battery life remaining on your iPhone. If the software or firmware isn’t communicating properly with the battery, it’s not going to display the right percentage. Just like apps on your iPhone, your iPhone’s firmware can have glitches, too. Wait. Isn’t This Deeper Than A Simple Software Problem? Yes. This isn’t your simple run-of-the-mill software problem where your battery is draining too fast because your apps are crashing. But it’s not necessarily a hardware problem either — so we need to address your iPhone’s firmware. So what is it? If it’s not “soft”-ware, and it’s not “hard”-ware, then its “Firm”-ware. To fix the issue with your iPhone shutting off even though it says there is still battery life remaining, we’re going to do a “DFU Restore”. DFU stands for Device Firmware Update. A DFU restore reloads your iPhone’s software and firmware, so it’s an even deeper type of restore than putting your iPhone into recovery mode. Check out my article to learn how to DFU restore your iPhone! Afterwards, come back here to finish up. Now that your iPhone is good as new and all your apps are downloading, give your phone a few days to recalibrate and get to know the battery again. I recommend fully charging your iPhone and letting it fully discharge a couple times before declaring the problem officially fixed or not. 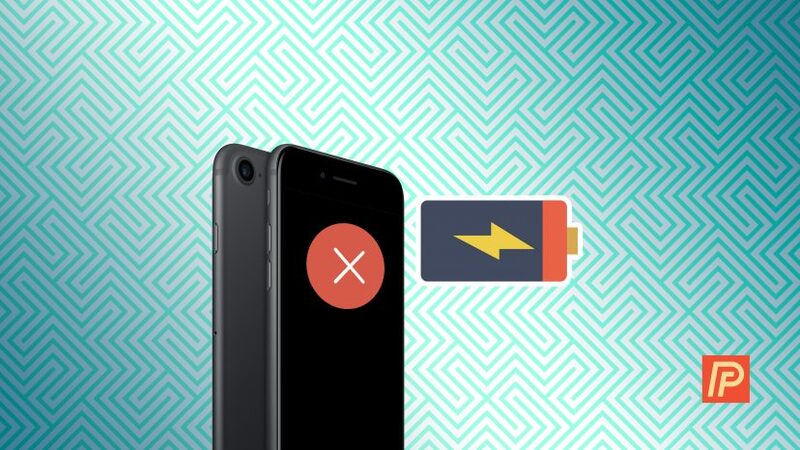 If the issue comes back after you’ve done a DFU restore, you’ve eliminated the possibility that a software or firmware problem is causing your iPhone to turn off with battery life remaining or, in some cases, to randomly jump from one percentage to another. If that’s the case, you may need to repair your iPhone. If you go through Apple, you can visit a local Apple Store (make an appointment first), or begin the repair process online. If you’re looking for a less-expensive option, I recommend Puls, an in-person service that can arrive in as few as 30 minutes to replace your battery, and offers a lifetime guarantee on their work. Some people try to use an external battery pack like the ones you’ll find on Amazon as a temporary stopgap, but if your iPhone is damaged, it may not help at all. Thanks again for visiting Payette Forward. I sincerely hope this article helped you stop your iPhone from turning off when it still shows a percentage of battery life remaining. I wish you the absolute best of luck and hope to hear from you! If you have any other questions, the Payette Forward iPhone Help Facebook Group is a great place to get answers. Previous ArticleApple Watch Bluetooth Not Working? Here’s Why & The Real Fix! Next Article Why Is My iMessage Not Working On My iPhone and iPad? Here’s The Fix!